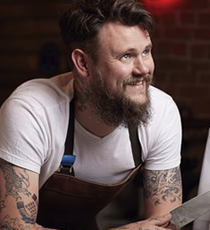 Benjamin Edmonds is the founder of Blok Knives– hand makes kitchen knives from his workshop in Derbyshire. Having worked in graphic design for 12 years, Ben stumbled upon knife making around 3 years ago. Teaching himself through trial and error, books and videos, he soon became addicted to his new-found passion. Now, Ben supplies his precision cutting tools to chefs and home cooks all over the globe, turning a hobby into a year’s waiting list. The Blok story is one of determination, drive and enthusiasm; wanting to make a product designed to last, in what seems to be an ever growing ‘disposable world’.